Stress, both physical and psychological, is attracting increasing attention among neuroresearchers. In the last 20 decades, there has been a surge of interest in the research of stress-induced manifestations and this approach has resulted in the development of more appropriate animal models for stress-associated pathologies and its therapeutic management. These stress models are an easy and convenient method for inducing both psychological and physical stress. To understand the behavioral changes underlying major depression, molecular and cellular studies are required. Dysregulation of the stress system may lead to disturbances in growth and development, and may this may further lead to the development of various other psychiatric disorders. This article reviews the different types of stress and their neurobiology, including the different neurotransmitters affected. There are various complications associated with stress and their management through various pharmacological and non-pharmacological techniques. The use of herbs in the treatment of stress-related problems is practiced in both Indian and Western societies, and it has a vast market in terms of anti-stress medications and treatments. Non-pharmacological techniques such as meditation and yoga are nowadays becoming very popular as a stress-relieving therapy because of their greater effectiveness and no associated side effects. 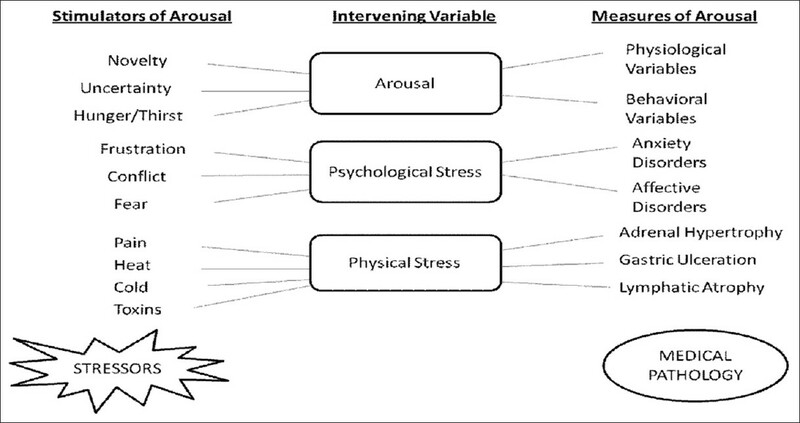 Therefore, this review highlights the changes under stress and stressor and their impact on different animal models in understanding the mechanisms of stress along with their effective and safe management. The pharmaceutical packaging market is constantly advancing and has experienced annual growth of at least five percent per annum in the past few years. The market is now reckoned to be worth over $20 billion a year. As with most other packaged goods, pharmaceuticals need reliable and speedy packaging solutions that deliver a combination of product protection, quality, tamper evidence, patient comfort and security needs. Constant innovations in the pharmaceuticals themselves such as, blow fill seal (BFS) vials, anti-counterfeit measures, plasma impulse chemical vapor deposition (PICVD) coating technology, snap off ampoules, unit dose vials, two-in-one prefilled vial design, prefilled syringes and child-resistant packs have a direct impact on the packaging. The review details several of the recent pharmaceutical packaging trends that are impacting packaging industry, and offers some predictions for the future. Objective: Gene therapy relies on efficient vector for a therapeutic effect. Efficient non-viral vectors are sought as an alternative to viral vectors. Chitosan, a cationic polymer, has been studied for its gene delivery potential. 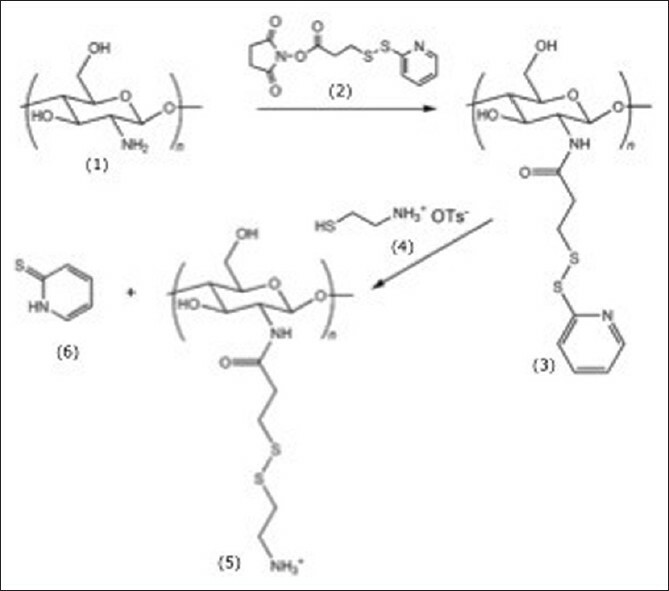 In this work, disulfide bond containing groups were covalently added to chitosan to improve the transfection efficiency. These bonds can be cleaved by cytoplasmic glutathione, thus, releasing the DNA load more efficiently. Materials and Methods: Chitosan and thiolated chitosan nanoparticles (NPs) were prepared in order to obtain a NH3 + :PO4− ratio of 5:1 and characterized for plasmid DNA complexation and release efficiency. Cytotoxicity and gene delivery studies were carried out on retinal pigment epithelial cells. Results: In this work, we show that chitosan was effectively modified to incorporate a disulfide bond. The transfection efficiency of chitosan and thiolated chitosan varied according to the cell line used, however, thiolation did not seem to significantly improve transfection efficiency. Conclusion: The apparent lack of improvement in transfection efficiency of the thiolated chitosan NPs is most likely due to its size increase and charge inversion relatively to chitosan. Therefore, for retinal cells, thiolated chitosan does not seem to constitute an efficient strategy for gene delivery. Purpose: Stroke still remains a challenge for the researchers and scientists for developing ideal drug. Several new drugs are being evaluated showing excellent results in preclinical studies but when tested in clinical trials, they failed. Many herbal drugs in different indigenous system of medicine claim to have beneficial effects but not extensively evaluated for stroke (cerebral ischemia). Aim: The present study was undertaken to evaluate chloroform and petroleum ether extract of Nigella sativa seeds administered at a dose of 400 mg/kg, per orally for seven days in middle cerebral artery occluded (MCAO) rats for its neuroprotective role in cerebral ischemia. Materials and Methods: Focal cerebral ischemia was induced by middle cerebral artery occlusion for two hours followed by reperfusion for 22 hours. After 24 hours, grip strength, locomotor activity tests were performed in different treatment groups of rats. After completing behavioral tests, animals were sacrificed; brains were removed for the measurement of infarct volume followed by the estimation of markers of oxidative stress. Results: Both chloroform and petroleum ether extracts-pretreated rats showed improvement in locomotor activity and grip strength, reduced infarct volume when compared with MCAO rats. 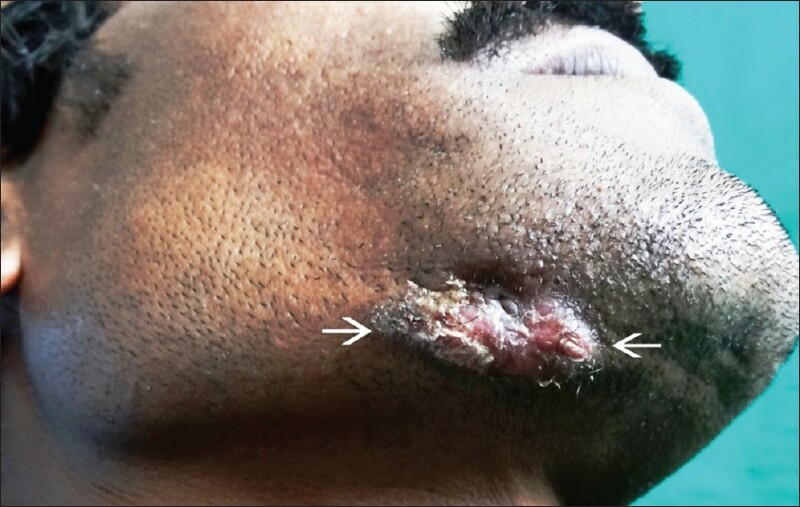 MCA occlusion resulted in the elevation of levels of thiobarbituric acid reactive substance (TBARS), while a reduction in the levels of glutathione (GSH) and antioxidant enzymes viz. superoxide dismutase (SOD) and catalase levels were observed. Pre-treatment of both extracts of Nigella sativa showed reduction in TBARS, elevation in glutathione, SOD, and catalase levels when compared with MCAO rats. Conclusion: The chloroform and petroleum ether extract of Nigella sativa showed the protective effects in cerebral ischemia. The present study confirms the antioxidant, free radical scavenging, and anti-inflammatory properties of Nigella sativa already reported. 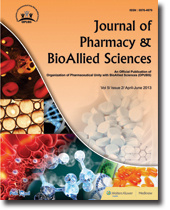 Purpose: Synthesis and antimicrobial activity of some Schiff bases of 3-amino-1-phenyl-4- [2-(4-phenyl-1,3-thiazol-2-yl) hydrazin-1-ylidene]-4,5-dihydro-1H-pyrazol-5-ones (TZP4a-l) are described. 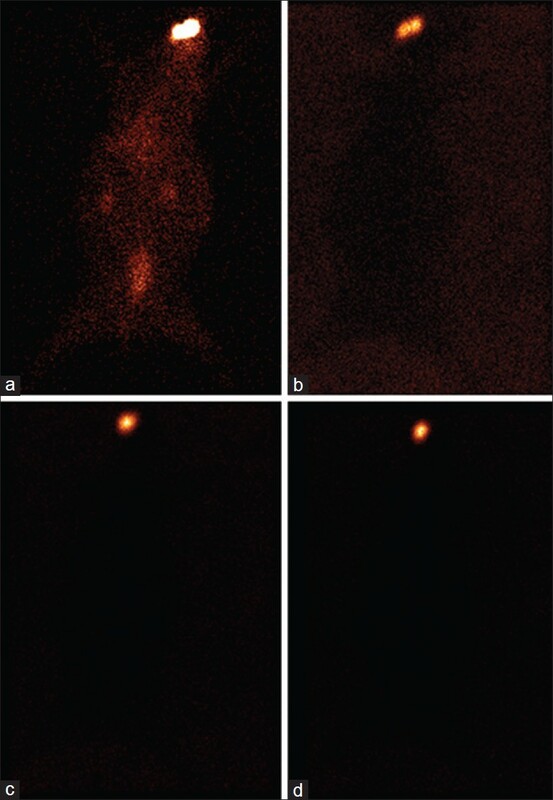 Materials and Methods: Structures of the synthesized compounds were confirmed using infrared, 1 H nuclear magnetic resonance, and mass spectral data. Synthesized compounds were tested in-vitro against four Gram-positive and four Gram-negative bacterial strains, three fungal strains and two mycobacterial strains. Title compounds were screened its in-vitro cytotoxicity (IC 50 ) by 3-(4,5-dimethythiazol-2-yl)-2,5-diphenyl tetrazolium bromide (MTT) assay using mouse embryonic fibroblasts cell line (NIH 3T3). Results and Discussion: Compounds TZP4 g and TZP4 h were found to be significant activity against Bacillus substilis (bacteria) and Aspergillus niger (fungi). In-vitro anti-tuberculosis (TB) activity of compound TZP4g showed appreciable antitubercular activity against Mycobacterium tuberculosis H37Rv strain (minimum inhibitory concentration [MIC] =0.6.48 × 10−3 μM/mL) which was 1.69 and 3.91 times more active than the standard drug, pyrazinamide (25.38 × 10−3 μM/mL) and streptomycin (MIC = 11.01 × 10−3 μM/mL), respectively. Their in-vitro cytotoxicity (IC 50 ) was determined to establish a selectivity index (SI) (SI = IC 50 /MIC). Compounds TZP4 c, TZP4 g, and TZP4 h have SI 82.85, 168.88, and 199.07, respectively. Conclusion: All the title compounds had mild toxicity on the mouse embryonic fibroblasts NIH 3T3 cells (IC 50 ≥ 100 μM). In comparison to the results of toxicity and antimycobacterial activity tests, it was observed that the activity of the compounds is not due to general toxicity effect; however, their antimycobacterial activity can be possibly because of their selective antimycobacterial effect. We concluded from our investigations that TZP4 c, TZP4 g, and TZP4 h may be considered promising for the development of new anti-TB agents. Aim: Study was aimed to assess the accuracy of drug dose and its frequency in patients with renal dysfunction in a tertiary care hospital. Materials and Methods: This was a retrospective observational study. Patients > 18 years old, with the serum creatinine (SCr) level > 1.4 mg/dl were included. Drugs prescribed to these patients were recorded in case record form. Drugs for which the dose was adjusted according to the clinical response to therapy, not according to SCr level (i.e., angiotensin converting enzyme inhibitors, diuretics, B blockers, anti-diabetics, etc.) were not taken into consideration. Based on the creatinine clearance which was calculated by Cockroft-Gault formula, dose and frequency of prescribed drugs were assessed using "Drug prescribing in renal failure - dosing guidelines for adults, 4 th edition" and by another literature. Data was analyzed using Statistical Product and Service Solutions by IBM corporation version 17.0 software. Results: Total 278 indoor patients were screened, out of which 205 patients included. Total drugs prescribed to the patients were 1338 with the average of 6.53 drugs per patient. 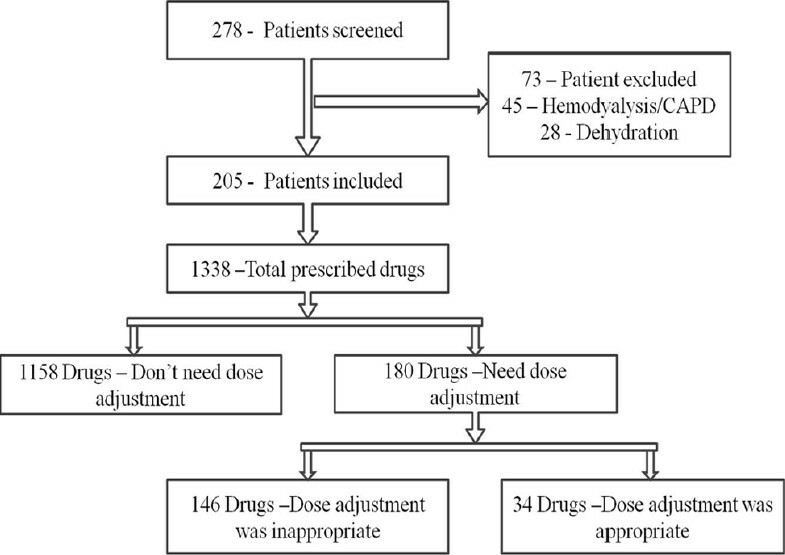 Out of these 180 (13.45%) drugs needed dose adjustment. Among them only 34 (18.89%) drugs were adjusted appropriately, and rest 146 (81.11%) were not adjusted. The most common group of drug that need dose adjustment was anti-microbials (144, 80%) with levofloxacin as individual drug. Conclusion: This study emphasizes the importance of patients with renal dysfunction and implementing appropriate dose adjustments. This study also suggests intervention such as on-line information to assist dose guidelines and participation of clinical pharmacologist could improve patient outcome. Aim: Alzheimer's disease (AD) is characterized by large deposits of amyloid β (Aβ) peptide. Aβ is known to increase reactive oxygen species (ROS) production in neurons, leading to cell death. In this study, we screened 15 plant seeds' aqueous extracts (PSAE) for inhibitory effects on Aβ (25-35)-induced cell death using hippocampus neurons (HIPN). Materials and Methods: Fifteen chosen plants were nine medical herbs (Japanese honeywort, luffa, rapeseed, Chinese colza, potherb mustard, Japanese radish, bitter melon, red shiso, corn, and kaiware radish) and six general commercial plants (common bean, komatsuna, Qing geng cai, bell pepper, kale, and lettuce). PSAE were measured for total phenolic content (TPC) with the Folin-Ciocalteu method, and the 2-diphenyl-1-picryl-hydrazyl (DPPH) radical scavenging effect of each seed extract was measured. To find a protectant against Aβ-induced oxidative stress, we screened 15 PSAE using a 2', 7'-dichlorofluorescein diacetate assay. To further unravel the anti-inflammatory effects of PSAE on Aβ-induced inflammation, PSAE were added to HIPN. The neuroprotective effects of the PSAE were evaluated by Cell Counting Kit-8 assay, measuring the cell viability in Aβ-induced HIPN. 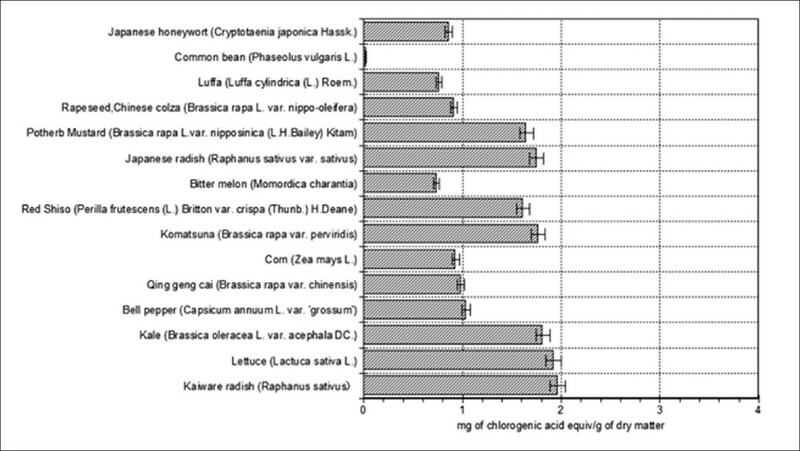 Results: TPC of 15 PSAE was in the range of 0.024-1.96 mg of chlorogenic acid equivalents/gram. The aqueous extracts showed antioxidant activities. Furthermore, intracellular ROS accumulation resulting from Aβ treatment was reduced when cells were treated with some PSAE. Kale, bitter melon, kaiware radish, red shiso, and corn inhibited tumor necrosis factor-alpha secretion by the Aβ-stimulated neurons and all samples except Japanese honeywort showed enhancement of cell survival. Conclusion: From these results, we suggest that some plant seed extracts offer protection against Aβ-mediated cell death. Aim: The current work is aimed at understanding the effect of pH on the thermal stability of hen egg white lysozyme (HEWL) at high concentration (200 mg/mL). Materials and Methods: Fourier Transform Infrared (FTIR) Spectroscopy with modified hardware and software to overcome some of the traditional challenges like water subtraction, sample evaporation, proper purging etc., are used in this study. Results: HEWL was subjected to thermal stress at pH 3.0-7.0 between 25°C and 95°C and monitored by FTIR spectroscopy. Calculated T m values showed that the enzyme exhibited maximum thermal stability at pH 5.0. Second derivative plots constructed in the amide I region suggested that at pH 5.0 the enzyme possessed higher amount of α-helix and lower amount of aggregates, when compared to other pHs. Conclusions: Considering the fact that HEWL has attractive applications in various industries and being processed under different experimental conditions including high temperatures, our work is able to reveal the reason behind the pH dependent thermal stability of HEWL at high concentration, when subjected to heat denaturation. In future, studies should aim at using various excipients that may help to increase the stability and activity of the enzyme at this high concentration. 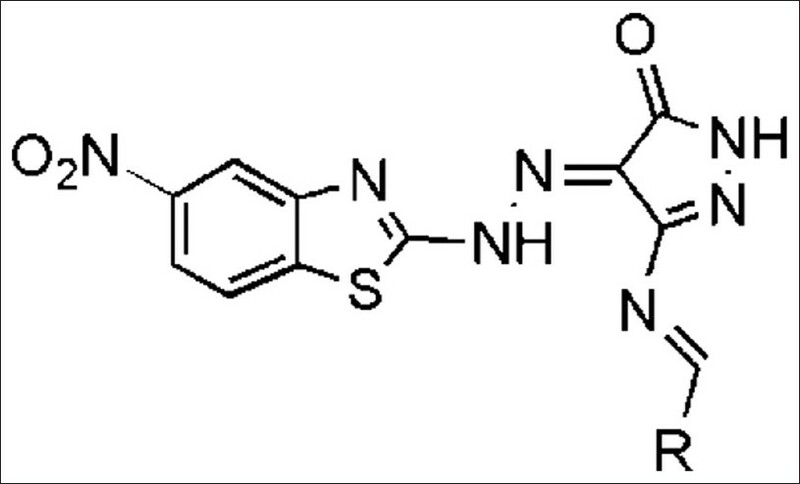 Purpose: In view of the potential pharmacophoric nature of imidazole nucleus, two series of imidazole derivatives, 2,4-disubstituted-1 H-imidazoles (2a-m) and 1,2,4-trisubstituted-1 H-imidazoles (3a-m), were synthesized with an aim of obtaining dual acting compounds i.e., anti-inflammatory and antifungal agents. 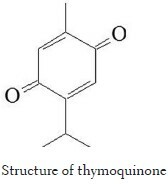 Materials and Methods: The title compounds were synthesized from 4-methoxyphenyl glyoxal (1) following multistep synthesis, and their structures were established on the basis of modern analytical techniques (IR, NMR and MS). 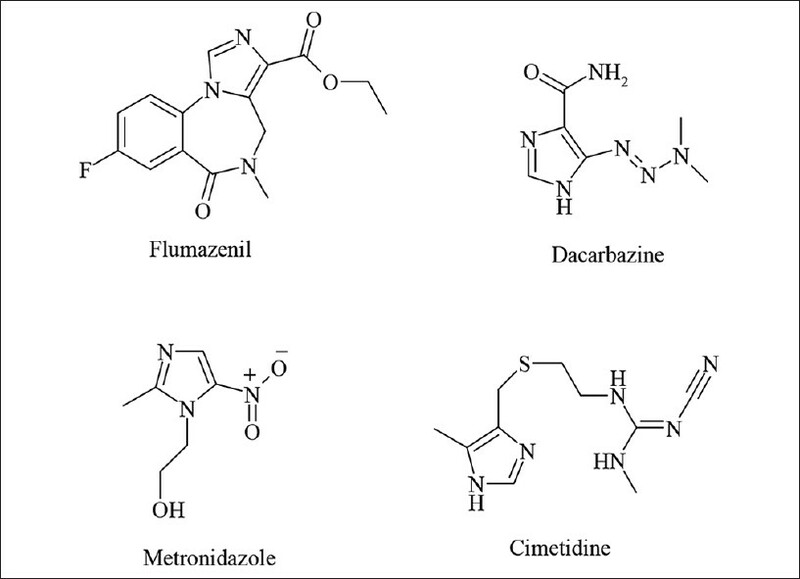 The synthesized imidazoles were tested for their in vivo anti-inflammatory activity. In addition to that, some compounds were also evaluated for their analgesic and ulcerogenic effects. The compounds were also evaluated for their in vitro antifungal activity. Results: Di- and tri-substituted imidazole derivatives (2a-m and 3a-m) were successfully synthesized. In in vivo anti-inflammatory test, six compounds (2 h, 2 l, 3 g, 3 h, 3 l and 3 m) exhibited good anti-inflammatory activity (49.58 to 58.02% inhibition) with minimal GI irritation (severity index; 0.17 to 0.34). These compounds were also tested for their analgesic activity and showed appreciable protection (40.53 to 49.60% protection) against saline-induced writhing test. Indomethacin was used as standard drug for comparison. In antifungal test, two compounds (3 h and 3 l) displayed appreciable antifungal activity (MIC; 12.5 μg mL -1 ) against the fungal strains tested. Conclusion: Two compounds, 2-(4-nitrophenyl)-4-(4-methoxyphenyl)-1-phenyl-1H-imidazole (3 h) and 2,4-di-(4-methoxyphenyl)-1-phenyl-1H-imidazole (3 l), emerged as lead compounds having dual biological activities; good anti-inflammatory as well as antifungal effect with lesser GI irritation. Proper availability of drug on to corneal surface is a challenging task. However, due to ocular physiological barriers, conventional eye drops display poor ocular bioavailability of drugs (< 1%). To improve precorneal residence time and ocular penetration, earlier our group developed and evaluated in situ gel and nanoparticles for ocular delivery. In interest to evaluate the combined effect of in situ gel and nanoparticles on ocular retention, we combined them. We are the first to term this combination as "nanoparticle laden in situ gel", that is, poly lactic co glycolic acid nanoparticle incorporated in chitosan in situ gel for sparfloxacin ophthalmic delivery. The formulation was tested for various physicochemical properties. It showed gelation pH near pH 7.2. The observation of acquired gamma camera images showed good retention over the entire precorneal area for sparfloxacin nanoparticle laden in situ gel (SNG) as compared to marketed formulation. SNG formulation cleared at a very slow rate and remained at corneal surface for longer duration as no radioactivity was observed in systemic circulation. The developed formulation was found to be better in combination and can go up to the clinical evaluation and application. Supernumerary teeth are extra teeth in comparison to the normal dentition. Their prevalence varies between 0.1% and 3.8%. Supernumeraries are more common in permanent dentition and its incidence is higher in maxillary incisor region, followed by maxillary third molar and mandibular molar, premolar, canine, and lateral incisor. The prevalence of supernumerary premolars is between 0.075-0.26%, and they may occur in single or multiple numbers Bilateral occurrence is uncommon and large percentage of supernumerary premolars remains impacted, unerupted, and usually asymptomatic; radiograph plays an important role in diagnosis of these. The present paper reports a case of bilaterally impacted completely developed supernumerary premolars associated with common clinical complication in unusual manner along with taurodontism of the upper and lower molars.